December 8, 2013 - Dixie Region SCCA held the 26th Annual Allies vs. Axis Solo Autocross at Spence Field in Moultrie, Georgia. Allies vs. Axis commemorates Pearl Harbor Day with a Solo event on the Sunday closest to the anniversary of the December 7, 1941 surprise attack on Pearl Harbor by Japanese forces, the event that led to American participation in WWII. 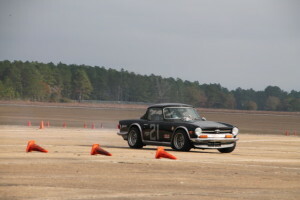 This event is a team autocross, with American and British ("Allies") vehicles competing against Japanese and German ("Axis") cars. Italian cars are Axis before lunch and Allies in the afternoon. Swedish cars, officially neutral, park in the paddock and sell stuff to both sides at enormous profit. Last year, we declared a moratorium on making bad jokes about French cars, in hopes that some would show up. None did, so I guess they’re still in the woods, hiding from the German cars. The day dawned foggy in Moultrie. The Axis team made their ceremonial first run around the course at precisely 7:53 AM, the time the first bombs fell on Pearl Harbor. The attack began as Marko Horn (an honest-to-Schnitzel, born in Germany, German-type guy) and Bryan “Shogun” Batchelor (who had a Japanese looking headband on) started around the course with both Japanese and German flags flying above their Honda. In the far corner of the site, shielded by the fog, they were joined by Floyd “Furu” Webb and Carlos “Kamakaze” Tomas in a second Axis car; Terry “P1” Nitti Jr and his gunner, Arty “Yaku” Gallegos in yet another Axis fighter along with Josh “Unicorn F*rt” Roqueplot, Heidi “Momma Bear” Nitti and Nicole “War Paint” Hamrick in the Honda Fit bomber. This fleet of Axis cars then stormed into the finish line. The Allies, stunned by this unexpected attack, recoiled in horror. The attackers parked next to the porta-potties and claimed them for the Axis. The odds were stacked against the Allies with 56 Axis entries versus only 32 in the Allied camp (and one Italian Fiat… More about that later.) for this 26th running of the event. The Axis powers also held an edge right out of the box with 12 uncontested classes. The Allies once again spread themselves into a “Thin Red Line” by bumping cars into higher classes to level the playing field against the numerically superior Axis team. The Axis forces went off to an early lead, and the numbers mounted against the Allies throughout the early runs as the Axis took nine class wins early in the day. With the numbers piled up against them, and in the face of the psychological warfare of Chris “Tokyo Rose” Yearwood filling their ears, the main Allied force took the field late in the afternoon. As the Allies of the third and last run group thundered their replies to the earlier screams of the Axis cars, the tide of battle turned. The Allied team came together with a monumental effort and once again came from behind to take 22 class wins overall. 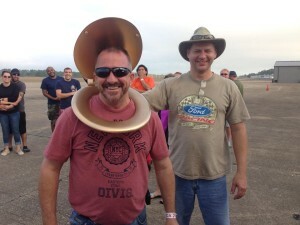 Street Tire Pax – Rob Ippolito, Ford Focus ST *The Fiat’s class win is an Allied win, because his fast run was his 5th! Repeating the story of WWII, against all odds the Allies came through victorious again. For the 26th year in a row, history has been upheld; the Allies prevailed and took 22 class wins against the Axis 16. The Allies also grabbed FTD (George Bowland) and FTD Pax (Matt Glagola) for two more wins on the day. The hero of the day was also, in a way, the surprise of the day. Mustang pilot Rob Ippolito found himself in the middle of an engine rebuild on his supercharged 5.0 and was not going to be able to drive the car for this event. He came out anyway, in his daily driver Ford Focus ST. A front-wheel-drive turbo four, not his usual RWD V8 Mustang. Totally out of his element, Rob signed himself up for the Street Tire Pax class, and won it! Apparently, this came as a really big surprise to one of the Axis-driving entrants in that class who had mistakenly thought Rob was in G Stock and that he was winning until he saw Rob’s name on top of the list in STP. You might say Rob “dropped a bomb” on him. In addition to class win trophies, the "Crappiest Run Golden Toilet Seat” award is given to the driver who has the crappiest run, or whoever falls victim to voter fraud. This is a "people's choice" award, with all entrants asked to vote early and often for their favorite crappy driver. This year the ballots were stuffed quite early, with a vote for JD Kemp noted in the ballot box before the day’s first runs started. One of the newer members of the group, Terry Nitti Sr. took home this prestigious award, likely due to the diligent (and multiple) voting of his son, daughter in law and various friends. 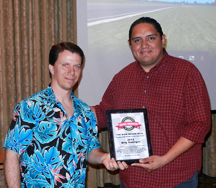 Awards were given again this year for best decorated Allied and Axis cars. 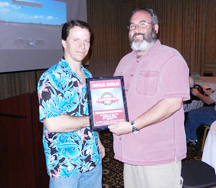 The Axis win went to long-time Dixie Region member Michael May’s Honda Fit. The Allied award went to Meghan Tarmey, in her P-40 themed Mini Cooper. A more recent part of Allies vs. Axis, Dixie Region collects toilet paper and cash donations for the Leon County Shelter for the homeless. Like previous years, the donations were managed by Bryan Batchelor and again this part of the event was a great success, with plenty of donations for the Shelter given by the entrants. There was a raffle for a free helmet, won by Terry Nitti Sr, immediately after he won the Crappy Run award, so it wasn’t all a bad day for “Senior”! We want to thank all that contributed, and this is a part of the Allies vs. Axis event that both sides can take pride in. 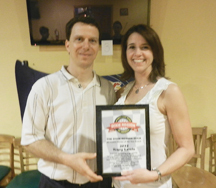 December 2013 - With another great year behind us, it's time again for the annual Dixie Region Awards. 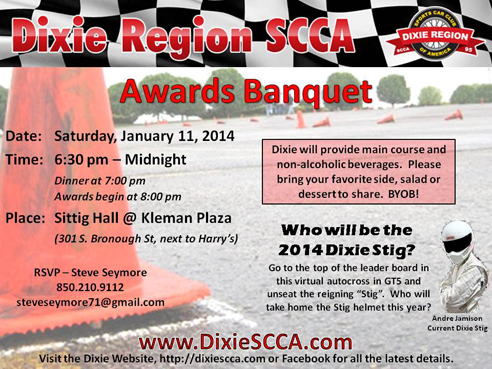 Come join in the celebration of all things Dixie with food, drink, racing and awards presentations. The region will provide main course and non-alcoholic beverages. Please bring your favorite side, salad or dessert to share. BYOB! You know the old saying, 10 percent of people do 90 percent of the work? Well, the same goes for our club. And as you can imagine, it takes a bit of work to schedule an entire solo season, let alone one event. There are a lot of volunteers needed to handle the promotion, sanctions, pre-registration, course reservation, course design, trailer and equipment delivery, course set up, registration, novice walk through, timing, scoring, safety, waivers, clean up, results, and on, and on, and on. 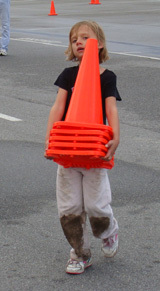 Dixie Region needs volunteers for 2013. The most immediate need is in registration, timing, and scoring. Get involved. Come to the membership meetings on the first Wednesday of every month where all the planning takes place. Meeting details are on the Dixie website here. Or you can contact one of the Dixie Board members or chairs if you have a particular interest. Or just show up at the event trailer the morning of an event and ask one of the organizers how you can help. We do need your help and the reward is so worth it. "The biggest change for 2013 is the introduction of the Match Tour format, featuring the Evolution Super Shootout. 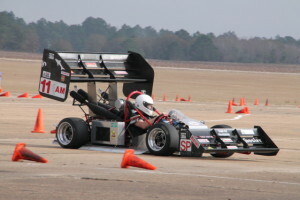 The inaugural Match Tour will be held at South Georgia Motorsports Park (hosted by Dixie Region) on the weekend on March 16th, (2013)." "The Match Tours format feature class competition on Saturday and the Evolution Super Shootout on Sunday. The Shootout format allows the forty-eight fastest drivers to mix with the top four ladies, as well as twelve random drawn drivers in a four-ladder tournament to see who can take home the big prize. Held on a traditional, championship style course, Match Tours are the best of both worlds, blending long, fast flowing courses with the excitement of elimination competition." Click here for Dixie Match Tour registration. 2012 award recipients were recognized at the Annual Awards Banquet held in January 2013. We appreciate the support of our busines sponsors. Please remember to send business their way! You can become a valued Dixie Region sponsor by contacting our Regional Executive, Mike Lollar at 850.459.5159 or .